Halloween decoration is probably the most fun holiday in the year. When we want to have a perfect decoration for any occasion we need some time to prepare ourselves and come up with new and fresh ideas so the decoration looks perfect. Although Halloween is almost two months away, we tried to gather some great ideas for your Halloween decoration. 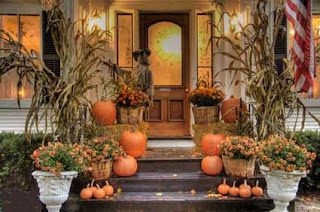 Check out these awesome and spooky Halloween decoration ideas you might get an idea how to decorate your front door or yard even spookier and more interesting. Halloween decoration has a special effect we have enjoyed it as children, and we surely enjoy it now as adults. It is now when all the creativity and imagination can come to light, and we can use it to create outstanding, original and inexpensive indoor Halloween decorations. Every retailer sells Halloween costumes, party supplies and decorations, but if you don’t want to spend several hundred dollars for a one-day holiday, then here you can find some of the most inspired decoration ideas that you can use at home. Besides, the following craft projects are very fun and entertaining as well. You’ve already got the lamp, so why not add a few silhouettes to spruce up your Halloween decor? It really doesn’t get much easier or cheaper than this! And, you probably already have the supplies on hand. Lanterns along with the classic carved pumpkins will be the “Stars of the night”, but why buy a lantern when you can easily create one at home? These lanterns look wonderful at your front door, they are inexpensive and they can be created within minutes. Huge Black Spider Start Halloween night off right by greeting your trick-or-treaters with a huge black spider! I like this idea for a large shrub or bush covered in spider webbing. A milk jug, black tape and pipe insulation is all you need to make this eight legged friend. Create scary silhouettes of witches, cats, ghosts, monsters, and any other Halloween decoration characters by cutting shapes from black cardboard and placing them on your windows with a little bit of scotch tape. I’m not suggesting that you paint your door green, but this Frankenstein door is too cool! The project itself will cost you under a buck, and for the ease and low cost, it sure does create a big impact.